I’m not a big fan of museums at all. Visiting them is not something we actively plan for, and if we went an entire trip without setting foot in one, there would be no tears. But, occasionally, we do find one (or two) that interest us. Nine times out of ten, it will be related to war history, which is more modern history and for us, more relatable to today’s world. War history is everywhere in Vietnam, and it is no more visible than in Ho Chi Minh City. A city, formerly known as Saigon, that has seen more than its fair share of war time. The Independence (or Reunification) Palace is most known for its place in the Vietnam War years. However, its rich history dates back to the 1860’s when the French held significant imperial rule over this country. One could also argue that it’s not technically a museum. Perhaps that’s why we liked it! From the 1880’s through to the end of World War Two in 1945, the French-Indochina Governors used this palace, known then as Norodom Palace, as their base. In 1945, the Japanese took control briefly, before handing it back to the French, who again held it until their defeat in 1954. In 1954, the palace became the home of the President of South Vietnam. More strife was to befall this building, when members of the Vietnam Air Force attempted to kill the President by bombing the palace in 1962. Whilst the President was not injured, others were, and the building was so badly damaged, it was demolished. The palace was rebuilt and renamed Independence Palace in 1966, becoming the home of a new President once more. As though it had a target on it, the palace was bombed yet again during the later years of the Vietnam War. The red circle below is one of two on the roof of the palace. The circles indicate the location of the bombs that were fired at the palace from aircraft. The new palace, an imposing Soviet looking concrete building, remained a target. On April 30 1975, it became the location for the ending of the Vietnam War as the National Liberation Front sent tanks crashing through the gates. The leader of the NLF went into the palace, taking down the existing flag and replacing it with one of their own. Today, the building remains government owned and is used for official business on occasion. It mainly serves as a museum, offering an insight into the former life inside. It’s a huge building, with vast, open spaces and walkways. There are internal courtyards where souvenirs of former presidents are on display. In the basement, a bomb shelter was built, given the propensity of the palace to be attacked. There are meeting rooms, elaborate official reception rooms and the laid back games room and cinema. I couldn’t wait to get to the roof where a wonderful view awaits you. On one side, the UF-1 helicopter, a sign of the US involvement in the Vietnam War, sits on the helipad. On the other side, a view down the street leading down towards the Saigon Central Post Office and the Church of Notre Dame. The furniture shows a strong influence towards its European heritage, with beautiful antique furniture. There’s a definite retro feeling here, and I am somewhat surprised when I remember I am in Asia and not in a European palace when I stand in some of these rooms. The President’s chair in his reception room sits up a little higher than the others and is adorned with a dragon head carving. I loved the State Banqueting Hall for no other reason than the gold, velvet-like carpet. If ever there was a colour that depicted opulence it’s this one. I can visualise this long table laden with wonderful food being shared amongst the dignitaries. In this room, with its bright orange high backed chairs, I can imagine the First Lady, entertaining her guests. Guests would stand at the windows, looking out over the gardens. The President and his ministers sat around this table, discussing the strategies of the day. Imagine the discussions that would have taken place here. Prior to 1975, many foreign ambassadors came to visit with the President and they would meet with him here. 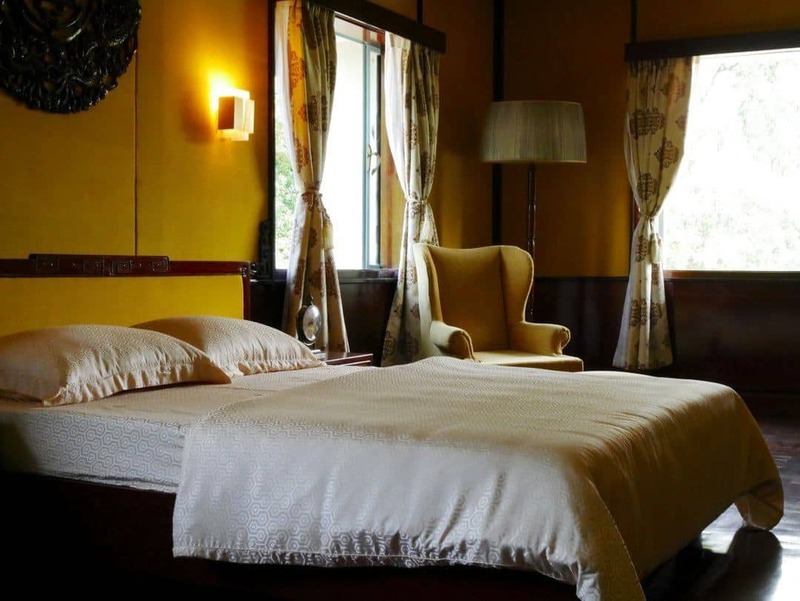 This room stands out from the overall feel of the palace due to it’s Japanese influences. One of the many planning rooms in the bunker. I just loved the reminder of communications in the 70’s. Through ancient and modern history, the Independence Palace has endured more than most, and yet it stands here today as a sign of the reunification of Vietnam. Opened to the public in 1990, it now offers group tours or the ability to wander around privately yourself. Events and exhibitions are held here also. The palace is open daily from 7.30am – 11am, re-opening again at 1pm until 4pm. Tickets are very cheap with adults costing 30,000 VND (about $A2) and students and seniors at reduced rates. If you are spending some time in Ho Chi Minh City, then a visit here will surely be on your list. If you only have 24 hours, a quick visit would still be considered worthwhile. Museums are always worth popping in to. You really never know what they will reveal, and they always offer an insight into the past. Thank you for sharing as Independence Palace is well worth adding to the list of places to visit. I’m with you- I’m not usually a museum person but occasionally I come across one that I feel is interesting. The 9/11 museum in NYC is very well done in my opinion. I need to get to that one. When I was last in NYC it was just getting ready to open. I have been to the museum a few years ago and it was really sobering. I think it is important to remember history. Yes it’s more interactive than a usual museum too. Wow this place is stunning, yoi can still say the place speaks of elegance and opulence beautifully designed and maintained. There is elegance everywhere that’s for sure and yes it is well maintained. I agree Sumti, they are all important in their own way, I just choose to be a little selective about the ones I visit. Yes, are very right! I also don’t like museums but very occasionally, I find one that could be of my interest and, the Independence Palace seems to be one of them. What I don’t understand, is why you say that it’s a Soviet building. What’s the relationship between the Soviet Union and this Palace? I realize now that lately I am only visiting museums that I know I will be really interested in in comparison to visiting the most popular museum as I was doing before. I would really love to visit Vietnam as it is a place I don’t know much about but it looks fascinating. The pastel color telephones are adorable and I love the banqueting hall as well! I think for me, it has to be about interest or else there’s no point doing it. As always, just do what you love and don’t worry about others’ opinions. There is the iconic Huey chopper. That was some beast back in the day. Very interesting interiors! I’d definitely visit if I was in Ho Chi Minh. What a shame that it had to be demolished in the 60’s. Thanks for sharing that bit of history! Yes the earlier one was full of French inspired decor so I truly would have loved to see this. I am also not really a museum-y person (apart from the V&A in London – amazing), but sometimes they are worth visiting to really get a sense of the history of a place. Historical museums are also the ones we like visiting, and this one definitely looks like a worthy visit! Yes Silvia, it’s really interesting and feels so real because of the existing furniture etc. I’m a museum goer so I would enjoy this and seeing all the rooms. 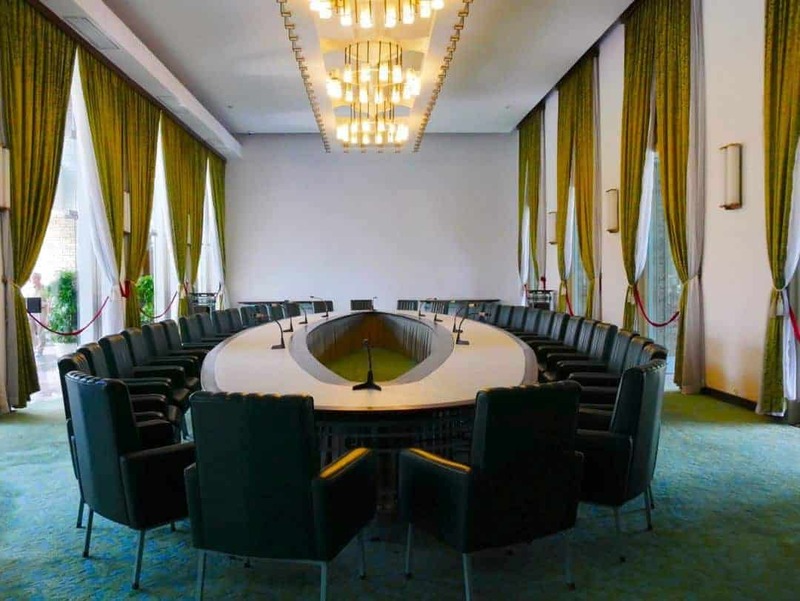 I think the Ambassador Chamber has the best style and color scheme. Thanks for sharing! Yes you would definitely love it then Lara, this one is a great one. I was injured a couple of years back so I had to halt my travels so I was stuck in Ho Chi Minh for a while. I spent most of my time wandering around museums. Definitely worth popping in to see! You shared the historical facts really well! Thank you! Thanks Anna, this one was a great one. Historical and interesting, I can see why you enjoyed this museum. The rooms were nice but it was the phones that caught my eyes. Remember before cell phones how we used to have to actually dial numbers rather than punch them in? It’s bringing back a lot of memories. I know I couldn’t resist taking a photo of these. I’m so impatient it would drive me nuts now having to wait for the dial to come back to you so you can dial the next number !! I am into that into museums either except for the Natural History ones. However, it is totally worth visiting this museum keeping in mind the rich war history of Vietnam. 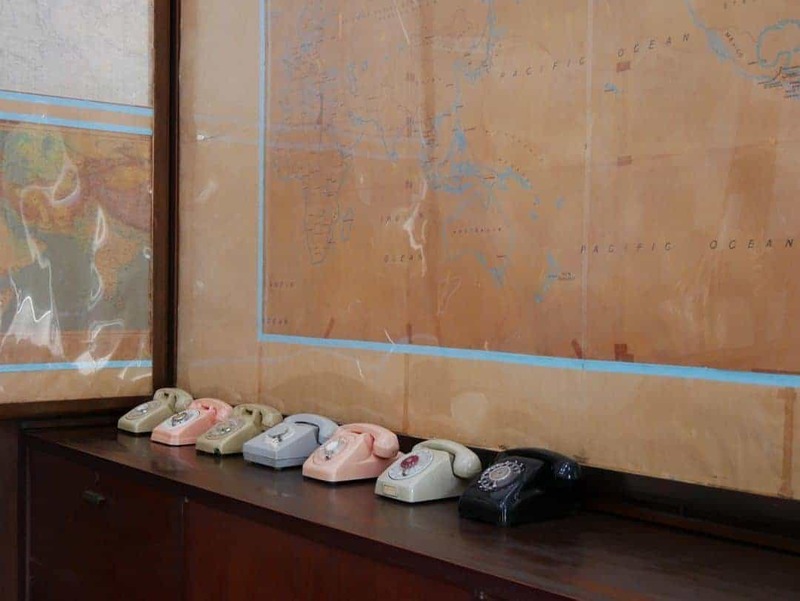 I specifically liked the photo of the bunker with the phone devices in different colors. So retro! Yes I have never understated the importance of them, just that I’m not someone who has to go to everyone, and spend my days there. There are some that are amazing though. We’ve been to several of these! There are so many great sights in Ho Chin Minh to see. We really need to get back it looks like we missed a few museums. This place sounds like it’s definitely worth checking out. I also really liked (although that’s not really the right word…) the Propaganda Museum in Ho Chi Minh. It’s a collection of all the crazy propaganda sent out by the Vietnamese during the war. Did you check out that one? No I didn’t get to see that but you’re right, it would have been interesting….the propaganda at the Cuchi Tunnels was full on, so can imagine what a whole museum full of it would be like. I love museums and learning about the history of a place and so this would be right up my alley. It looks so grand and unique. Thanks for sharing your photos and experiences there! Pleasure Karla, thanks for stopping by. I didn’t stay in Saigon when I visited Vietnam so I missed out on this museum. Generally I quite like museums, especially where such a historical place has been turned into a kind of museum. There’s the summer palace in Da Lat which has a very similar feel with regards to decor, and even the concrete exterior! I’ll be sure to stop by the Independence Palace when I return to Vietnam. Yes the concrete was definitely a sign of the times here. I think you’d love it. Museums like the Independence Palace are my absolute favorite. I visited a similar kind of historical museum in Bucharest, The Peoples Palace and loved the experience. So much historical significance all around you, not just pieces of it set behind glass! If there was only one thing I could do in Ho Chi Min City, I would choose to visit this museum. If they are your thing you would definitely love them. I really enjoyed this one ! Great post. I always try and pop into a museum so I can get the feel of the history. This palace has such an interesting and strong military background. Will have to check it out! The place is awash with history, just even the fact that no one calls it HCMC – it’s still Saigon !! When in Vietnam I did not have the time to visit Ho Chi Minh. A pity because this museum looks very interesting to understand the country’s history. Thanks for sharing. We’ve been looking at planning a trip to Vietnam, and this sounds like a really interesting museum that we would have to check out. I can see how you would feel like you were in Europe from the rooms inside–they do really have a European vibe to them! My husband isn’t the biggest fan of museums either, but I think he would like this one too. Thanks for sharing! It’s definitely worth a visit. Interesting that you can relate this back to your books ! I’m actually a pretty big fan of museums, so I’m sure I’d be stopping in during my visit. I love history and since I was in the military for a few years I also enjoy seeing helicopters and other military vehicles. I love how cheap the entrance fee is also! We explored the war museum, it has a lot to share and to talk about. i learned a lot but also got so sad about the Agent Orange. I guess you really pick up a lot from museums. I’m a fan of modern architecture and it’s really interesting to see the bland and stolid Communist-era design quite common in government buildings built in the 1970’s around Southeast Asia ! I find it really interesting to read the view of a Westerner about this place – I was born in Vietnam and used to live in Australia too. My expat friends love it, but would love to hear your thoughts! Cheers!